Muscovites play board games at the Central Gorky Park, Moscow. Intense one-on-one games of chess and checkers are giving way to games that can be played in groups as a way to socialize. Old Soviet movies feature numerous scenes of men in parks hunched over chessboards, and indeed classic board games like checkers, chess and dominos were incredibly popular in the Soviet Union. The first “Western-style” board games appeared in the Soviet Union in the 1980s. One of the most popular was a Monopoly-style game called “Manager.” In it, the players were supposed to buy up Soviet industrial enterprises. Few of them thought at the time that just a couple of years later, the familiar plants and factories would really end up in private ownership. Today a new world of board games is taking over from these classic ones. 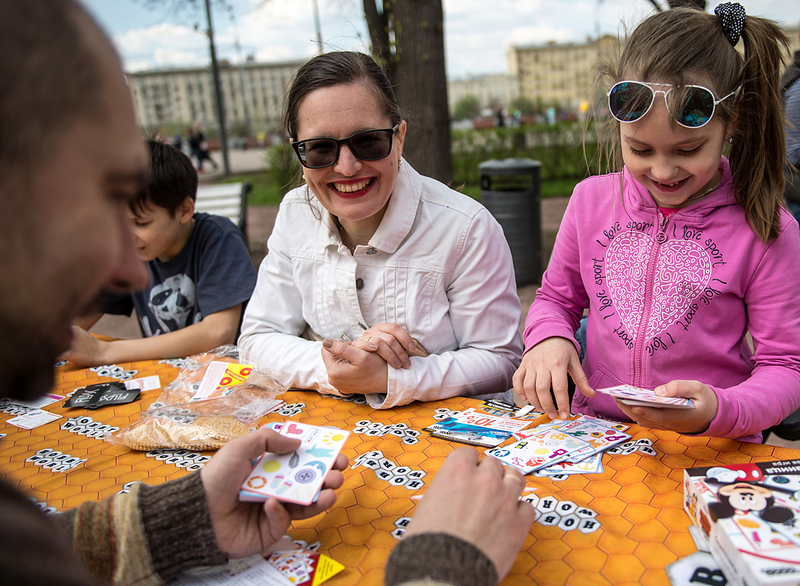 Variations on deck-building games, question and answer games and even board game version of video games are becoming the latest party trend in Russia. Russians play games as a way to socialize, says Sergei Abdulmanov, marketing director of game manufacturer Mosigra. “Overall, the Russian market is developing towards party games rather than niche-interest offerings for geeks,” he said. The current board game boom took off in Russia about 10 years ago, according to the DISCOVERY Research Group, and most players favor original games developed by local companies. The Mosigra company is successfully commercializing a popular yes-and-no style guessing game, while the Hobby World company has launched a board game version of the card game Mafia, which is hugely popular in Russia. Hobby World has also developed board games based on the popular computer game World of Tanks and on Dmitry Glukhovsky’s post-apocalyptic novel Metro-2033. Spyfall is a psychological game that tests the players’ abilities to deceive their friends. Each player receives a card stating their location and role: for example, if all the players are on a submarine, one of them is the captain, another is the navigator and others are sailors. The players cannot disclose their roles or locations because one of them is a spy. The spy does not know where he or she is, and must to guess the location from the conversations between the players. The other players try to identify the spy. MindMaze is a yes-and-no question game structured as a board game (in German & in Polish). The narrator chooses a story from the game box that describes a strange situation and outlines the story to the players. The goal of the players is to guess what preceded that strange situation. The narrator can be asked questions, but can reply only with “yes” or “no.” For more advanced players, there is an additional element of competition: more complex stories are worth a different number of points. The storylines vary depending on where the game is sold, so those interested in using the game to get a peek into the Russian mentality will have to learn Russian and play the local version of the game. “In the original version, there were some completely weird stories, for example, how a resident of Veliky Novgorod was trying to escape from traffic police on a steamroller,” Abdulmanov explained. An example of a riddle from a foreign version of the game: Six aircraft crashed at a U.S. airfield in one day, but not a single person was injured. How could that happen? Answer: That day, Turkish cadets were practicing at the airfield. One of them reported to the air traffic controller that his engine had died. The air traffic controller responded: “Turkish cadet, eject from the aircraft!” All the six cadets followed the instruction. The game Nefarious is easy to play, but it requires some strategic thinking. It features a board with fun cartoon drawings, and each round lasts between 25-45 minutes. The goal of the game is to create some crazy inventions before the other players. Achtung, Panzer! The card game version of World of Tanks can bewilder fans of the blockbuster computer game with its unusual gameplay. Despite its militaristic name, the game is much more about building your own arsenal (deck of cards) rather than fighting your opponent. In order to come out as the winner, you will have to negotiate, cheat and bluff the other players. Don’t try this game if you are an anxious or nervous person or have a quick temper — rounds can easily descend into real-life fights! Berserk is a Russian version of Hearthstone, albeit without collecting cards. It is yet another game that focuses on building your deck of card, but this time with a fantasy theme. The Hobby World company raised $57,000 on Kickstarter to develop the game — far above the $15,000 it was expecting — and as a result, the game has an excellent design. In order to win, you need a good strategy and good luck.